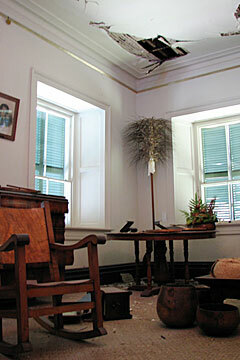 Huge chunks of a room ceiling and museum items lie on the floor of an upstairs bedroom of the 168-year-old Hulihee Palace in Kailua-Kona after the Oct. 15 earthquakes. Restoring historic buildings, park facilities and scenic mountainsides damaged by the Oct. 15 earthquakes could end up costing several million dollars, a state official said yesterday. Exactly how high the total will climb depends in part on more geological assessments and whether the state decides, for instance, to remove some rockfall hazards or warn people to stay away from them, said Peter Young, director of the state Department of Land and Natural Resources. There is also the question of whether the state can get money from the Federal Emergency Management Agency or elsewhere to help with the unexpected expenses. Another question is how available, or costly, some of the historic restoration work needed for Kailua-Kona's Hulihee Palace or Iolani Palace on Oahu might be. Young said he plans to meet Monday with FEMA officials to go over the damage total so far and to conduct site inspections of Kealakekua Bay and Hulihee Palace on the Big Island and Iolani Palace on Oahu. The department oversees state parks, natural areas, recreational boat harbors and some historic buildings. Damage estimates posted this week on the DLNR Web site total $1.6 million so far, but the figure will grow, Young warned. It does not include the potential "several million dollars" cost of removing rocks from the pali that overhangs Kealakekua Bay, where falling boulders and rocks prompted a partial closure of the bay and the state land at the base of the cliffs. Damages to remote trails has not even begun to be calculated, Young said. "I saw photos of areas that I remember as a kid going up -- trails between Pololu and Waipio valleys. You can see a trail going up to a point, and then there's a slide and there's nothing there anymore," he said. Decisions about whether to restore such trails or permanently close them will come later, Young said. » Hulihee Palace, built in 1838 and renovated by King Kalakaua in 1886, has extensive damage, though not to the extent of earlier concerns that it is not structurally sound. » The Kailua-Kona's wharf has extensive cracking in its concrete deck slab, pile caps, stairways, walls and boat ramps. If the cracks are not fixed, corrosion will eventually destroy the structure. » A monument marking King Kamehameha I's birthplace in Kohala has damage to rock walls. » The rock walls of the 600-year-old fishing village at Lapakahi State Historical Park are down in numerous places. » Makena State Park on Maui needs at least $100,000 worth of rock-scaling work to make its Big Beach safe -- and could require much more if multiple slide sources overhanging the park's Black Sand Beach are addressed. » Hapuna Beach State Recreation Area has damage to rock veneers, wood and cement components of restrooms and rest shelters that if not fixed will cause further deterioration. The DLNR plans to keep posting damage estimates online as it gets them, Young said. Two new Disaster Recovery Centers to help earthquake victims will open on the Big Island next week, and four existing centers will be kept open additional days, state and federal officials said yesterday in a news release. » A new center will open in Honokaa on Monday and Tuesday at the Honokaa Gym, 45-541 Lehua St.
» Another new center will open in Naalehu on Thursday and Friday, in a mobile unit at Naalehu Park and Community Center. » The center at the Sheraton Keauhou Bay, 78-128 Ehukai St., Kailua-Kona, will remain open through Wednesday. » The center at the Puueo Community Center, 145 Wainaku St., Hilo, will remain open through Wednesday. » The center at the Old Courthouse Senior Center, 54-3900 Akoni Pule Highway, Kapaau, North Kohala, will remain open through next Saturday. » The center at Parker Ranch Shopping Center, 67-1185 Lindsey Road, Suite H-139, Waimea, will remain open through Nov. 21. The centers provide information about grants, low-interest loans and other aid available to residents affected by the Oct. 15 earthquakes. The centers are open 9 a.m. to 6 p.m. Mondays-Saturdays and noon to 4 p.m. on Sundays, according to the FEMA release. Residents are encouraged to register for assistance by phone or online before going to the Disaster Relief Centers. Phone assistance is available 6 a.m. to 6 p.m. every day at 800-621-FEMA (3362) or 800-462-7585 for the hearing and speech impaired. Internet registration is at www.fema.gov any time. 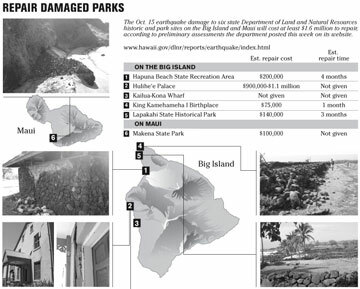 State park damage estimates are at www.hawaii.gov/dlnr/reports/earthquake/.